Note: I traveled to Cuba in 2013 and wrote an article shortly after that talked about efforts in Cuba to rejuvenate Havana and its old buildings, its culture, its economy, and its place in the world. But it is a different story now because much has happened since I first wrote it. People from around the world are rushing to Cuba before the Americans are turned loose on the island. So, rather than let the article lie in the ASCII code of a computer file, I’ve added a bit to it and offer it here. This is my experience with Cuba. As we hiked across the parking lot to the bus at José Martí International Airport in Havana, fingers began pointing toward the airport parking lot. There they were: a 1953 Chevrolet and a 1952 Ford. A bright sun sparkled in the windows and the aging American beauties seemed to wink at us from their parking spaces. American automobiles from the 1950s buzz around the streets of Havana and Cuba’s highways. Treated well by the climate, and so they have rusted little, Cubans still have to be resourceful to get aftermarket or machined parts to keep these old timers going. 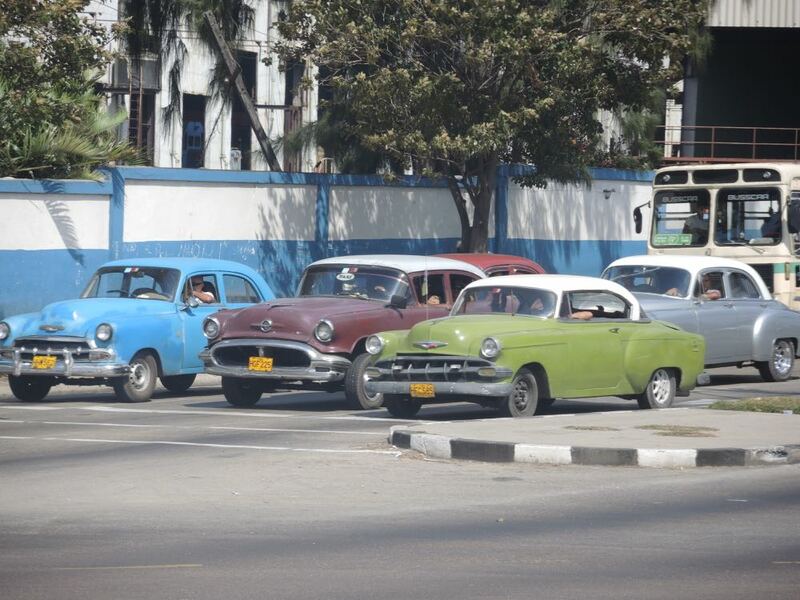 When I had laid plans to visit Cuba, I had imagined 1950’s American cars driving on Havana’s streets. I had also looked forward to a visit to Finca Vigia, Ernest Hemingway’s home during his time there. I found both, but beyond that, I really hadn’t known what to expect. The biggest surprise for me was to discover a distressed island bobbing in the Caribbean, lost in time, casting lifelines wherever it could. I found a Cuba sorely in need of rebuilding and rejuvenation—both of its infrastructure and its economy. In 2013, I traveled to Cuba on a People-to-People cultural exchange program authorized by the U.S. Department of Treasury. Begun in 2000, Americans have used this travel opportunity to explore the enigmatic island of sugarcane, tobacco, and rum long forbidden to them through five decades of travel restrictions. It remains (at this writing) the only legal way for Americans to travel to Cuba. But it’s not the only way. Furthermore, travel to Cuba is getting even less restrictive for Americans. As you will learn shortly, there is now a general license, issued by the Office of Foreign Assets Control (OFAC),that makes travel to Cuba a lot easier. I sit across the booth from a friend and his wife who have just returned from an unauthorized trip to Cuba. Ernesto “Che” Guevara, the physician turned revolutionary, is deeply revered and immensely popular in Cuba, probably more so than Fidel Castro. Che’s image is everywhere, whereas I noticed that Fidel Castro’s image is much less evident. A Canadian travel agency provided my friends with Cuban visas for $35 each. They are issued as separate documents on which entry and exit stamps get pressed. They don’t get permanently fixed to a passport page as other visas. With the documents in hand, my friends flew to Cancun, and from there to Havana. They hadn’t realized it at the time, but they did not need the visas in advance. While required to board a flight to Cuba from Mexico, the visas are also available at the airport prior to boarding. Palm trees waved to us from the delightfully warm tropical sky as we exited the airport. We passed tiled roofs filled with TV antennae on the drive into the city. After the obligatory stop at the massive Revolution Plaza, where Fidel Castro is said to have delivered six- to eight-hour oratories, we drove through old Havana. 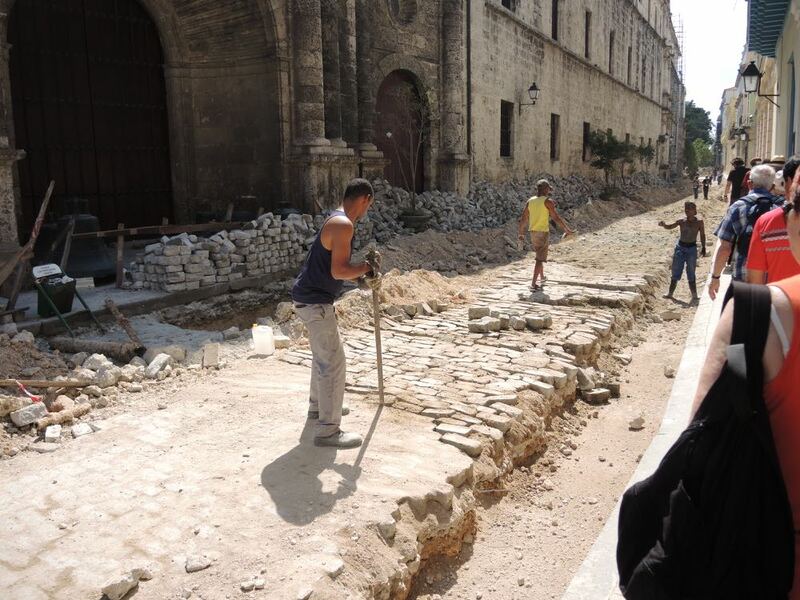 Havana’s infrastructure is in desperate need of attention. Cubans have begun to repair the city, and the hope is that renewed relations with the United States, and its attendant increase in commerce and investment, will help them rebuild their city and their country. I was surprised to see a city of so many buildings with rotting wood, chipped walls, doorways without doors, and even some with portions of a wall missing. Everywhere in the city, it seemed, buildings needed maintenance and paint. But more than Havana needs attention. The entire country is in a similar state of stress. In 1991, with the dissolution of the Soviet Union, Cuba lost most of its trading partners. It fell into an extended period of severe economic distress known as the Special Period, which lasted through the decade. It was during this time that Cuba expanded its tourism efforts to help replenish the struggling economy. Tourism has now replaced sugar cane and tobacco as the country’s primary source of income. And now tourism is about to explode. In fact, President Obama had hardly released his handshake with Raul Castro in December, 2013, at Nelson Mandela’s funeral before the world’s media hummed with speculation of a thaw in relations between the two countries. Some in the media speculated that something was in the works. They were right. Only a year later, President Obama announced an initiative to restore full diplomatic relations with Cuba. “In Cuba, we are ending a policy that was long past its expiration date,” Mr. Obama said in the State of the Union address in January. “When what you’re doing doesn’t work for 50 years, it’s time to try something new.” Actually, the two countries have met semi annually for years to discuss issues such as migration and resumption of postal services, and Cuba and the United States have been trading in agricultural products since 2008. Indeed, one New York City tour operator, according to a March 29 Associated Press article published on the Pioneer Press’s TwinCities.com website, experienced a booking increase for travel to Cuba of nearly 250 percent by the end of March. On May 4, the Shanghai Daily published an article saying that the Cuban National Office of Statistics and Information has reported an unprecedented 1.1 million visitors to the island in the first quarter of 2015. While Americans must still currently travel to Cuba under license, the process has become considerably easier. OFAC, part of the U.S. Department of the Treasury, has issued general licenses within the 12 categories of authorized travel, which means that, if the travel you plan falls within any of these categories, you can just get a ticket and go to Cuba. All you have to do is keep records. (You can find out more by looking at the OFAC FAC sheet located at http://www.treasury.gov/resource-center/sanctions/Programs/Documents/cuba_faqs_new.pdf). Raul Castro, after becoming president in 2008, began actively promoting Cuba by encouraging tourism, and he appears fully engaged the current effort to revitalize Havana. We confirmed this during our 2013 visit when we walked through old Havana with 34-year-old architect Daniel de La Regata. He is working with a local organization to restore the city. 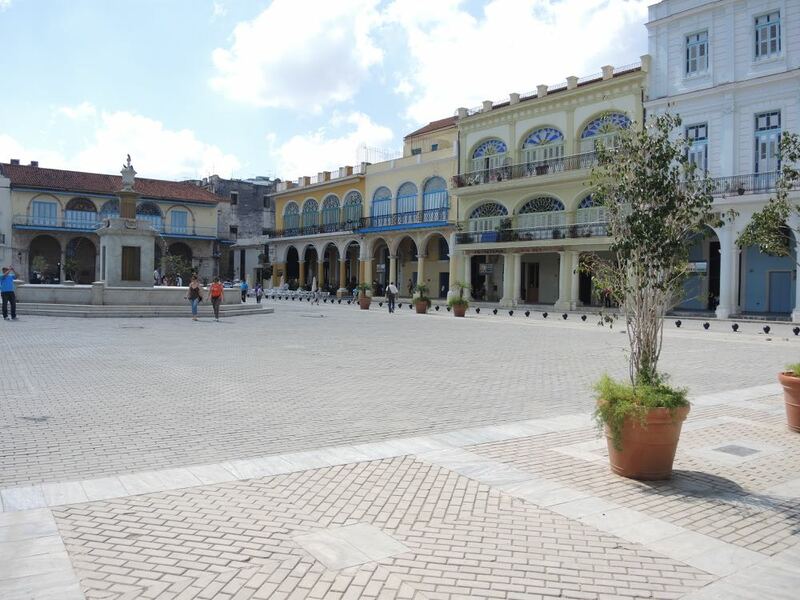 One of the main plazas in Havana that has undergone the slow process of renovation. Cubans look forward to warmer relations with the United States, especially increased commerce and goods that will help them rebuild their country’s suffering infrastructure, but they are concerned about being overwhelmed by American and other foreign developers. De La Regata freely admitted that the U.S. embargo of Cuba is the main reason for unavailability of quality products for the restoration. But he was quick to add that, generally, Cubans bear no animosity toward Americans. And he predicted that an expanded economic and political relationship between the two neighbors was coming closer. He was right. As we walked into one of the city’s restored plazas, we saw buildings with fresh, clean faces. Evidence of restoration is recorded in large, before-and-after pictures hanging in front of each building. To my surprise, a street artist thrust a caricature of me drawn on glossy tag board in front of my face. I fumbled for a coin for a tip. This happened a second time by another street artist who saw me quite differently. This activity is part of the new Cuban commerce. In late 2012, the Cuban government allowed citizens to start small businesses. Now they can sell their apartments or houses, but only to other Cubans. Private farms have cropped up, as have some cooperatives. All over the city we encountered small shops in the nooks and crannies of buildings, and numerous street performers and vendors. And today, with travelers from the world over rushing to the island, citizens can test their entrepreneurial skills by applying for permits to rent rooms in their homes, similar to a bed-and-breakfast (B&B). The program is known as Casa Particular and was started in 1997 to allow Cubans to rent rooms to tourists, thus providing Cubans with new sources of income. For a monthly fee, Cubans can get a permit and go into business. It turns out that the glut of visitors now pouring into Cuba has revealed a woeful lack of commercial lodging, so the Casas Particulares are in demand as they try to pick up the slack. 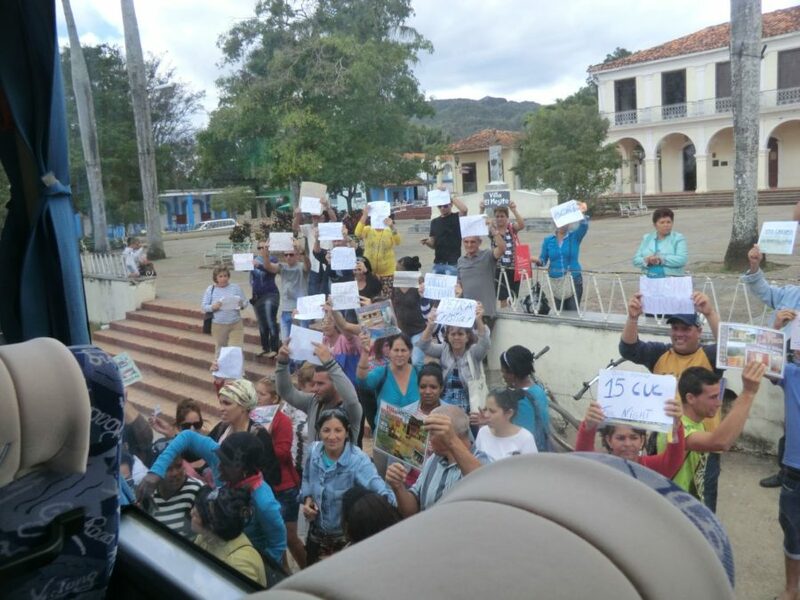 A crowd of Cubans hoping to rent travelers a “casa particular” gathers in Viñales to greet tourists as they get off the bus. Although Cubans started renting rooms to tourists in 1999 with the approval of the government, recent changes in the island country have allowed locals to open shops, restaurants and other entrepreneurial enterprises. After a bus ride to Viñales in the western part of the island, the two had no trouble finding a casa particular. Locals met the bus with signs and photos hawking their accommodations. Although Havana is going through the throes of revival, I found it easy to visualize the city’s past majesty during our drives along the malecón, a four-mile breakwater in the harbor. Across the harbor is the Cuban fortress, Morro Castle, built in 1589 by the Spanish. On Saturday nights and holidays, the malecón teems with social activity as hundreds of young Cubans dance, eat, and generally hang out. During our five days in Havana, the people-to-people cultural exchange theme of our visit took center stage. We visited neighborhoods to see revitalization efforts on a smaller scale. Most of the time, enthusiastic citizen groups from the neighborhoods greeted us, and their enthusiasm was often contagious. At one presentation, almost our entire group was dancing with the locals. The Cuban National Museum was a pleasure to see, especially because our in-house guide, Omar, spoke excellent English and was, perhaps, a latent entertainer. He very delicately led us through the displays of Cuban art, which is often sexually explicit, and deftly told the group as much, or as little, as it wanted to know. Earlier that morning we had visited the national cemetery, a 138-acre burial ground with 2.5 million people interred there. I must admit, I thought that a cemetery tour was a bit of a stretch; however, it was one of the trip’s highlights. 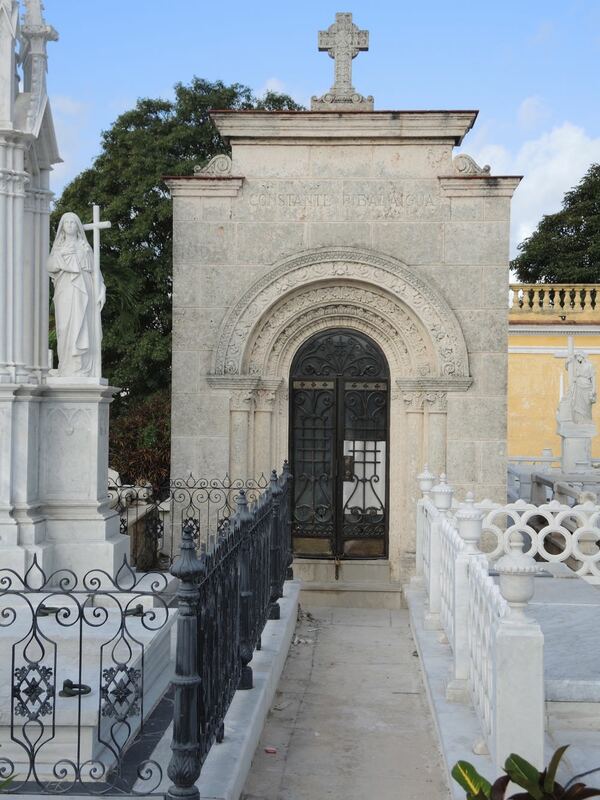 Constante, the bartender said to have invented the frozen daiquiri and bartender to Ernest Hemingway, lies at rest here in Cuba’s national cemetery, along with prestigious land owners and business barons. It was made so by Andres, the cemetery guide. A thin, slight man with a booming voice, Andres explained that initially, those buried there were the wealthy from the coffee, sugar, or tobacco businesses. That has changed over time. At least one person buried in the cemetery is not from the traditional businesses. His name is Constantino Ribalaigua, known as Constante, and he was Ernest Hemingway’s bartender. He worked at, and later owned, El Floridita, where he is said to have invented the frozen daiquiri. The historic fish restaurant and cocktail bar, and the daiquiris, were Hemingway’s favorites while he lived in Havana. It’s still there, complete with a life-sized statue of the Nobel Prize-winning author standing at the bar. Learning that tidbit of information whetted my appetite to see Finca Vigia. Hemingway lived in Havana from 1939 to 1960. He paid $12,500 for the house and the 15 acres of land on which it stands. 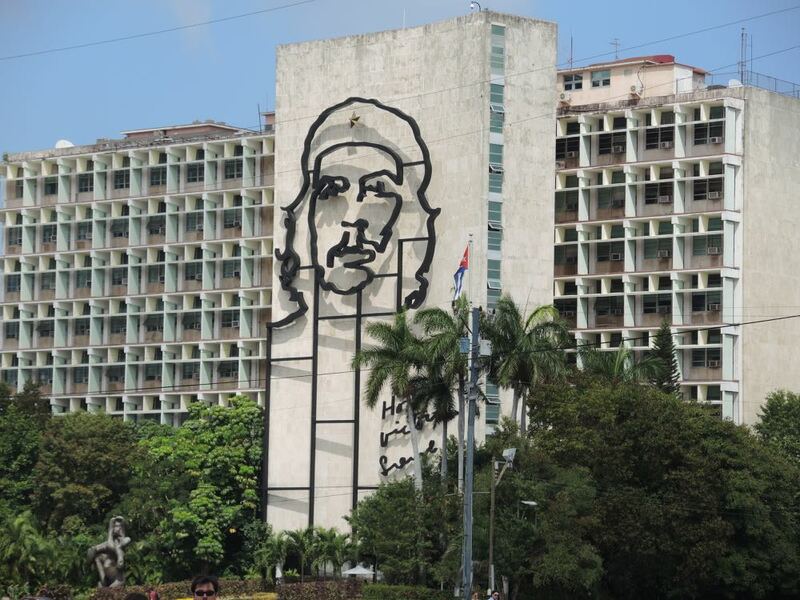 Although he owned it at the time of his death, it now belongs to the Cuban government. Visitors may not enter the house. Instead, the windows are kept open to allow guests to view the various rooms from the outside. 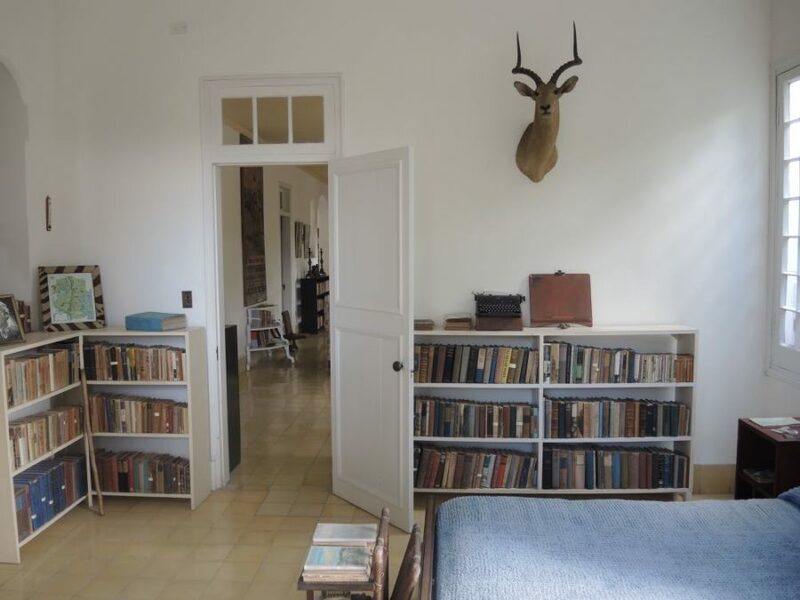 This is Ernest Hemingway’s bedroom at Finca Vigia, his home in Cuba. Because of a war injury, Hemingway preferred to write standing up. Note the portable Royal typewriter on the bookcase. Perhaps the most exciting site for me was to look into Hemingway’s bedroom where the author did his writing. Hemingway wrote standing up because of a war injury. Looking through that bedroom window, I could see his portable Royal typewriter propped up on a couple of books on the waist-high bookshelf next to the bed. This is where he wrote, The Old Man and the Sea. The bathroom is particularly interesting. The author had the habit of regularly recording his weight on the bathroom wall just next to his balance beam scale. The record is still on the wall! Ernest Hemingway’s fishing boat, Pilar. It is on display on the grounds of his home in Havana. 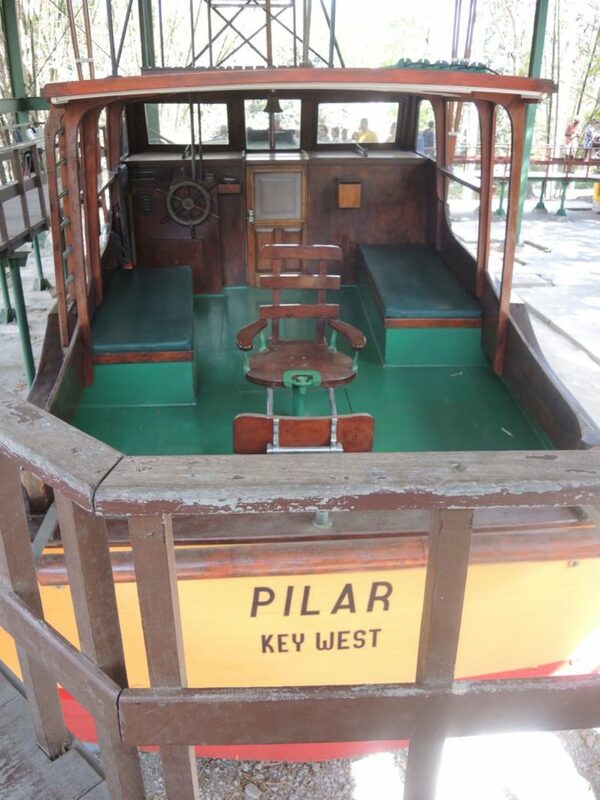 Hemingway’s famous fishing boat, Pilar, is now dry docked at Finca Vigia, and visitors can walk around the wooden craft on a board walkway and stand within 10 feet of the chair where Hemingway sat and fished the Gulf Stream for marlin. Not to be confined to Havana, our cultural exchange itinerary found us early one morning on a bus shaking along a patched, bump-ridden, four-lane highway to the western province of Pinar del Rio. The drive was sprinkled with a variety of sights: people on the roadside waiting for a bus, bicycle riders with packages lashed on the back, livestock grazing just on the side of the road, a two-wheeled, horse drawn cart with 23 people stacked onboard and farm refuse in the back, and farmers working their fields with oxen. Pinar del Rio is home to the spectacular Viñales Valley, a UNESCO World Heritage Site where tobacco farms still use centuries-old agricultural practices. The tobacco grown here is used to produce some of the world’s most highly prized cigars. Tobacco leaves hung curing in bunches on long poles at the farm we visited, and the farmer rolled cigars for anyone in the group who wanted one. Although tourism is now the number one revenue producer for Cuba, cigars remain an important export and source of income. When the Soviet Bloc disappeared, Cuba found itself in a food crisis, which led to the development of organic farms, both urban and rural. This we saw first hand during a visit to a 15-acre organic farm in Pinar del Rio. The one-room farmhouse perched atop a hill overlooking the Viñales Valley on a site that certainly would bring millions of dollars in the U.S. real estate market. Tiered rows of crops flowed down the hill from the farmhouse like a hooped skirt. The farmer told us that he and his family—wife, daughter, and son-in-law—together with three farm hands, work the land. Without doubt, Cuba remains economically burdened. Food is still rationed even today. But Cubans appear full of the hope that the expanded economic and political relationship with its powerful and rich neighbor portend a more prosperous future. It appears that at least one of the lifelines has been caught and is now being secured. Within weeks, President Obama is expected to announce the resumption of diplomatic ties with Cuba, and the two countries can then exchange ambassadors. With luck, Cuba will be able to pull itself to the shore of a very different existence than the island has known for the past 50 years.